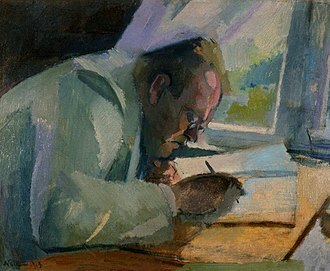 Max Reger lived just half of a lifetime, but he produced at least three lifetimes worth of work in his 43 years. On May 11, 2016 we celebrated the centenary of his death by sharing the magic of his life with our cozy audience in Lotte Lehmann Concert Hall. Jeremy Haladyna, our tenacious advocate for newer music and champion of the UCSB Ensemble for Contemporary Music pushed ahead the quarterly ECM performance so that we could celebrate Max’ life on his very special anniversary. The program focused on Reger’s chamber works — ECM is a chamber group, after all. We were fortunate to have two special guest artists play with our ensemble, Hiroko Sugawara did a fabulous job of bookending the concert on clarinet, and Christina Esser, mezzo-soprano, sang a selection of Reger’s charming Simple Songs. The lyrics are the sweet and simple part -these are stories about home and family, kittens and mice, laid against some devilishly enticing melodies. As a life-long fan of the hedgehog, I particularly enjoyed Der Igel, a warning to all to beware the Prickly-Coated One. But like the kitten, I stray ahead! The concert opened with our professor, Jeremy Haladyna, accompanying Hiroko Sugara on the clarinet. Hiroko is not just a member of ECM, she’s a member of the UCSB faculty, teaching Japanese in the East Asian Languages and Cultural Studies department. I played clarinet for a few years in middle school band, so I have a little bit of appreciation for how amazing her playing is. She hides a great deal of breath control behind that lovely smile! The two played Reger’s Sonata for Clarinet and Piano in B-flat, I Moderato, op 107. Dana Anex followed with a lovely solo, Prelude for Solo Viola, from Three Suites, op 131d, an excellent example of Reger’s foray into neoclassicism. She was followed by Kathryn Carlson, cellist, playing Peter Sculthorpe ‘s Requiem( for Cello Alone). The two solo pieces were tremendously moving. Haladyna chose to follow these solos with the Simple Songs, a wise move when your ushers don’t have tissue boxes to pass around for the tear-gathering. I followed Simple Songs with a personal tribute to another “Max”. Sir Peter Maxwell Davies passed away just two months ago on March 14th. Davies was a composer and conductor, in fact, Master of the Queen’s Music from 2004 – 2014. I played Dances from his opera, The Two Fiddlers. Davies passed away on his beloved Orkney Islands, an archipelago in the Northern Isles of Scotland; my tribute piece is in the style of the Orkney Islands fiddlers. I really shouldn’t say “my” piece — I shared it with Petra Peršolja on piano. According to my mom, we were very well received, but she always says that. I know that we did a decent job because we played right before a brief intermission, and when I peeked through the curtains, nobody was running for the exits! When the curtain rose after intermission ( Ok, I lie, we don’t really use the lovely and mysterious red velvet curtain. ), Petra Peršolja and Zachary Olea played Arvo Pärt’s Fratres I. I am looking forward to hearing them play more pieces like this together in the future. Zachary is a patient violinist and shows that he has a considerable understanding of what Pärt is trying to convey. Petra is one of our DMA students, and she is a very charismatic performer. She has the grace and ability to make everyone she performs with look as good as she does, even if that means holding back sometimes. Our ECM classmate, Nick Mazuk, found a piece that he wanted desperately to play, and if nothing else works, desperation gets you everywhere with Professor Haladyna. So along with Dana Anex on viola, and Kathryn Carlson on cello, Nick treated us to selections from Vincent Persichetti’s Serenade No. 6, op. 44, including II. Barcarole, V. Intermezzo, and VII. Dance. It’s always a delicate balance when you put a trombone between two stringed instruments in a modestly-sized concert hall, but I was quite impressed that the strings were able to hold their own, and that Nick was able to exercise his instrument’s dynamic range without blowing the other instruments off the stage. Any of our composition students who happened to be in the audience hopefully were able to learn something last night about how to mix’n’match strings and horns without breaking anything. At last, we circled back to Reger. Kathryn Carlson and Professor Haladyna played the Sonata in A Minor for Cello and Piano ,Op.116, IV. Allegretto con Grazia. It was truly lovely. Zachary Olea returned for a second Arvo Pärt piece, Für Alina, this time with Danica Neuhause. I’ve included a link to the Wikipedia entry for the piece — I spent a little more time there trying to understand how the piece is put together. It’s my first recommended reading to you, my little audience, so go for it! What really sent me hunting for explanations was the dynamic tension the two violinists were able to maintain. I’d heard the piece played before with a completely different interpretation. I should mention that Danica very patiently turned pages for our pianists, and it was nice to finally hear her play! At last, Hiroko retook the stage with her clarinet to close our show with three movements from Reger’s Clarinet Quintet, Op. 146, II. Vivace, III. Largo, IV. Poco Allegretto. Joining her were David Fickes, a talented junior transfer student we welcomed this year into our violin studio, and Zachary Olea (violin), Dana Anex (viola), Kathryn Carlson (cello), and Jeremy Haladyna, to conduct. Have you ever watched your parking permit expire while you are trapped in a concert hall? It’s usually a gut-wrenching experience waiting for the final three movements of a piece to finish, hoping that the campus ticketeers have not come for your car. But honestly, I would have paid the price of a parking ticket happily just to keep listening to the quintet all night — it was that warm and comforting. As things turned out, there was no ticket, my parents took me out to dinner, and I got a great night’s sleep, knowing that I had done my small part to make the Regar Year, 2016, a success. To find out about other Reger Centenial Festival events go here and here.